Patricia Leitch died earlier this year. She wrote one of the best ever pony series with the Jinny books, and book eleven, Horse of Fire, has one of the most magical Christmas scenes in a children's book. This post is dedicated to Patricia with thanks for the many presents she gave the world through her books. Jinny and Shantih are appearing in the local nativity play. Jinny has fine and splendid dreams about how she and Shantih will appear as glorious king and even more glorious horse, but when the moment comes, it's not like that at all. Jinny is cast into utter misery by the rude disconnect between her dreams and reality, but then, as they're leaving, a little boy stops and stares up at Shantih. "I think Christmas Eve is the most beautiful of all nights," said Mrs. Marsham. She pointed towards the uncurtained window. 'Look how bright the stars are tonight. One couldn't help but know that it's Christmas night just by seeing them. And then there's a sense of silence somehow. I know we all rush about and make lots of noise and upset things, but beyond ourselves, the very atmosphere close around us seems so very still, waiting. It's the one night when I believe in magic.' Happy Christmas Eve. Veronica Westlake's The Ten Pound Pony is one of my absolute favourite books, and hopefully one of Susan Keith's, who suggested this, too. This excerpt is set on Christmas Eve (as is tomorrow's), and I really need to say nothing about it as it makes all the points it needs to perfectly well on its own. We all went to bed for a short time after that, as later on we should be walking three miles into New Fratton (and back) to go to Midnight Mass there, and I think we were all in a strange, dreamy, unreal state when, with a slight shiver, we stepped out into the brilliant moonlight and started our long walk through a shining fairy-land of frost and snow. I couldn't let Christmas pass without another episode of Jillish Christmas. In Jill Has Two Ponies, Jill gets an early Christmas present of two loose boxes. She gets her mother a splendid white cushion "from a shop that appeared to be the kind of place that furnished palaces," and both are delighted with their presents. Jill's other presents more than make up for this bounty. They are presents with a theme. Jonathan Meredith is sitting watch his mother sort out the Pony Club files at Christmas time as she tries to work out which Pony Club members are possibles for the team. Moorland Mousie is an even earlier pony story than Joanna Cannan's A Pony for Jean, and it's one of the best examples of the pony-tells-its-own-tale stories that were so popular in the early decades of the 20th century. 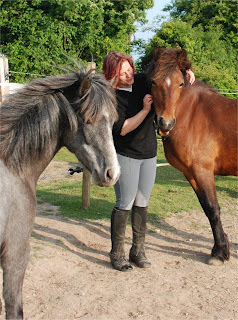 Moorland Mousie is an Exmoor pony, and the book tells his story from foalhood through being rounded up and broken, to his somewhat chequered career as a child's pony. Mousie and his companion Tinker have been left terrified of humanity after being rounded up. Fortunately Patience, the daughter of Colonel Coke, who bought both ponies, takes things very, very slowly, and provides an object lesson in how to treat a wild pony. By Christmas, she's made progress. Today's book is supremely well titled for this time of year: it's Wendy Douthwaite's Christmas Pony. Many thanks to Sue Howes for suggesting it, and also for providing the text. My personal collection of pony books stutters to a stop around 1980, so Wendy Douthwaite rather passed me by. Sue has however swept to the rescue from the deepest South West. 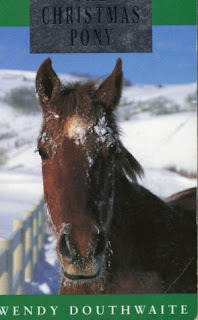 The Christmas Pony is the story of farmer's daughter Lindy, whose mother died. Her father has now remarried, and this is Lindy's first Christmas with her new stepmother, Susan. They don't get on, but the relationship improves over the course of the story, and Lindy ends up with guess what.... actually rather more than she bargained for. HUGE spoilers about to follow, so don't read on if you'd like to read the book for yourself and discover the surprise. The Advent Calendar choice for today is Josephine Pullein-Thompson's Prince Among Ponies. Like Diana's I Wanted a Pony, this doesn't really focus on Christmas, although there is a mention. The whole glorious focus of this book is Adonis, the beautiful but wayward grey pony Patrick and Sara discover when they go and visit some family friends. He is possibly the uber-pony gift (although there is of course Cascade, Tamzin's part-Arab pony in Wish for a Pony). Prince Among Ponies ticks all the Pullein-Thompson boxes - there's good and sensible riding set against the bash and point school, humour, and a good set of relationship dynamics. Many thanks to Vanessa Robertson for suggesting this book for the advent calendar. The advent calendar thus far has had only a cursory mention of Jill - or to be more accurate, Black Boy, and not even him, his day rug. The day rug crops up again here, because it's one of Jill's Christmas presents in the first Jill story, Jill's Gymkhana. Some pony books shoot through Christmas at a rate of knots, but in Jill's Gymkhana you get an entire chapter titled Christmas. While writing this, I've changed my mind and am going to focus on a different bit of the chapter, as I have covered Black Boy's day rug every year I've done this calendar. Why? Why am I obsessed by this? 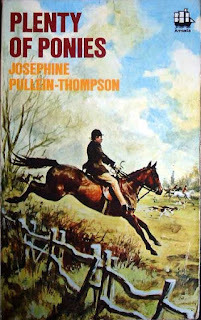 Today's book is Diana Pullein-Thompson's I Wanted a Pony. Many thanks to Kerry Newson for suggesting it. I wonder how many of you spent the run up to Christmas wishing fervently for a pony, and whose Christmas lists to Father Christmas featured one thing, a pony? Mine certainly did, and I would usually be told to write another one because Father Christmas needed a few other things to go on in case he couldn't get a pony. Sadly, Father Christmas never did prove equal to the task of providing a pony for me. I made do with other people's experiences, and Augusta, heroine of I Wanted a Pony possibly remains my favourite girl-gets-pony story. I love Augusta's feisty refusal to accept her cousins' view of her, and her dogged persistence in raising the money to buy Daybreak. As promised, here is a regular winter favourite. This is another childhood favourite of mine. I loved the World's End series, with its family existing with virtually no adult input, in a ramshackle old inn (something of a theme emerging here - yesterday's book also features a rackety and dishevelled house) filled with the animals the Fielding family rescue. This book does actually have the Fielding parents present. Jerome Fielding's brother, Rudolph comes down, with his wife Valentina, to spent Christmas. Jerome, unable to resist a desperate attempt to prove to his brother that he is a success, announces that a newspaper will print his book. This backfires terribly when Rudolph says that now Jerome is earning, they can pay rent for World's End. Before this disaster, the Fieldings have their own present giving. Elder brother Tom has brought everyone animals, and for Lester, there is a cage of robins. The next two Advent Calendar books are hoary old favourites. I nearly went ahead and told you what tomorrow's will be, but you'll have to check in tomorrow to find that out. Today's book is Black Hunting Whip. I loved this story when I was growing up, and I still do, even now I have traded in my trusty and very battered 1960s paperback Armada for a smart-ish* hardback. Black Hunting Whip is the first of the Punchbowl Farm series - to be truly accurate, it's the second, but No Mistaking Corker doesn't take place on the farm, and is a rather different animal to the rest of the Punchbowl series. I have spent much of my house-owning life taking on houses no one else wanted because they were so vile (among my son's first words were "Be careful!" which he would mutter to himself as he negotiated the gaps in the floorboards and other traps that made for a house which was a careful mother's health and safety nightmare). Today's Advent Calendar swoops across the pond, and is courtesy of my friend Christina Wilsdon. Chris introduced me to this book (in fact she gave me a copy). 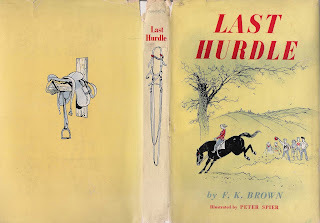 It's F K Brown's Last Hurdle, and it's the story of Kathy, her brother Ned, and her horse, Baldy. Chris calls him a work-in-progress, and that's exactly what he is. It's a lovely, lovely book. I checked on the book selling sites, and it is, thankfully, reasonably easy to obtain over here. I can highly recommend it. Here's a lovely Christmas excerpt, which captures both the comfort and excitement of family tradition, and the bliss of getting a Christmas present that is so well suited to you it fulfils a need you didn't even know you had..
"Christmas Eve arrived in a blur of anticipation and happiness. She and Ned, after supper, stamped through the house carrying lighted candles and singing carols at the top of their voices. Diana Pullein-Thompson's A Pony for Sale is the story of Martini, the pony who becomes a Christmas present that goes wrong. Broken in by Guy Beaumont, he sells her to the Cox family as an early Christmas present for their daughter, Pip. Pip is initially thrilled by Martini, a far cry from her outgrown patent safety pony, Rex, but Pip is nervous, and inclined to be influenced by others. She is too nervous of her parents to tell them that things are not going well with Martini, too afraid of her friend Tessa to tell her to ride sensibly and not hot Martini up, and too afraid of being despised to ask for help. After a disastrous hunt in which Martini bolts, Pip finally plucks up the courage to tell her parents how badly things are going. They blame Guy Beaumont, and Martini is sold on to the brutal Lydia Pike. Pip gives up riding altogether shortly afterwards after a fall broke her nerve. Today's Advent Calendar book is Josephine Pullein-Thompson's Plenty of Ponies - the early Armada edition below, with the truly awful backward seat, is one I'm sure Josephine disapproved of tremendously. She and her sisters were both fierce advocates of Caprilli's theory of using the forward seat when jumping. The Esmond family, heroes and heroines of the book, have been ruined by money. When they lived in a cottage and had to scrape round and do everything themselves, they were much nicer characters, Charlotte thinks. Now they have a large house, a pony each, a groom, and people to help in the house. The Esmonds decide to start a society devoted to improving their characters. and all of this is given impetus by what happens after Christmas Day. Lucy Rees' Wild Pony is today's Advent Calendar title, and is the suggestion of Lucy Bruckner. 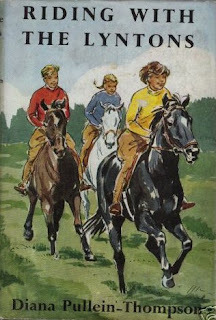 Wild Pony was Lucy Rees' first book, and she wrote it while she had her own riding school, which no doubt provided her with plenty of raw material on which to draw. 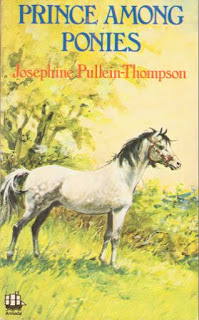 Heroine Pippa and her parents move to the country (Wales) and Pippa, classic star-crossed, pony-less girl, dreams of having a pony now that having somewhere to keep it isn't the huge problem it was while living in town. Today's book has been chosen by Sabrina Ferguson, and it's The Perfect Horse, by Gillian Baxter. 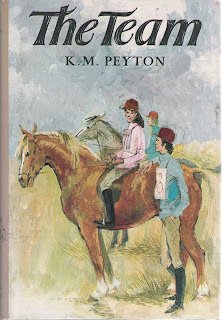 It's the third in the Bracken Stables trilogy, which starts with Jump to the Stars, in which heroine Bobby battles with an unsympathetic school, and a worse than unsympathetic aunt to achieve her dream of working for stable owner Guy Matthews, and riding the chestnut mare, Shelta. The Difficult Summer had what I would call a bit more than difficulties - an aeroplane crashes onto the stables and causes a fire. Horses die, Guy ends up in hospital, and buildings are destroyed. All that has been overcome by the time of the The Perfect Horse. Gillian's cousin, Ellen, reappears, asking Bobby and Guy to find her a horse she can event on - rather a surprising request for a girl who we feel rides because it's socially acceptable. The horse they find is called Minos, and he never puts a foot wrong. Ever. Katharina Marcus is a brilliant YA author. I first came across her when I read (and reviewed) her first book, Eleanor McGraw, a Pony Named Mouse and a Boy Called Fire. Her Boys Don’t Rideblew me away, and was my book of last year (in case you’re wondering, there won’t be an equestrian fiction review this year as I simply haven’t read enough to be able to comment). There are some great perks to working as an editor, one of which is working on books that you love, and earlier this year I worked on Katharina’s latest, The Boy with the Amber Eyes. It’s the sequel to Eleanor McGraw, and I am biased, but it is a great read. I’ve done links below the interview if you’d like to try any of the books. I was delighted when Katharina agreed to an interview. So, over to Katharina... JB: Why do you write?